Sandlot Swag clothing represents a community of baseball players who participate in a way of life that is different from other sports. The Sandlot Swag brand is dedicated to the growth of the great game of baseball through fashion, while providing the fans of the game with the gear to represent their sport off the field. 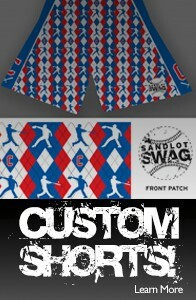 Sandlot Swag is excited to deliver our cool and unique baseball shorts to die-hard baseball fans everywhere. Players can now “Rock The Swag” 24×7, long after the final out is recorded on the diamond. Sandlot Swag Baseball Shorts — Get Yours Today! Sandlot Swag Baseball Shorts are comfortable baseball apparel for kids of all ages. Rock the Swag in the cool, crazy baseball shorts all the youth baseball players are wearing off the field to represent the sport they love.